Many thanks for your recent email. 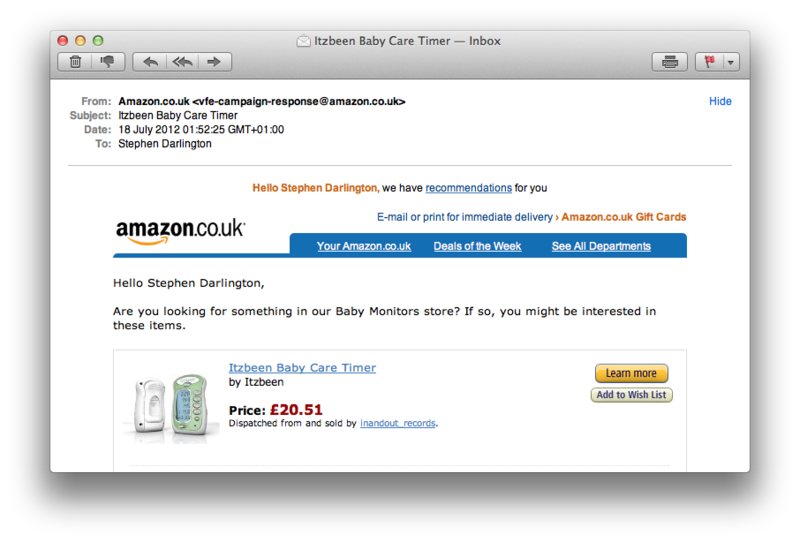 Unfortunately, your normally very accurate data mining and customer relationship management software seems to have turned up very much the wrong product recommendation for me. You see, as great as the Itzbeen is, Wandle Software now has something even better for any mums (or moms) to be or those with recent new-borns: Rootn Tootn. Not only do you always have your iPhone with you, making it much more convenient, but Rootn Tootn does more too! You can set as many timers as you like and rather than just telling you when your last feed and your next feed will be, it also keeps a history. And who’d want an Itzbeen with its green plastic when you could have a sleek iPhone and Rootn Tootn which allows you to use your own pictures as a backdrop? !